Useful instruments: a mandoline for the courgette, but otherwise a cheese slicer should do as well. If you don’t have either of these, leave out the raw courgette altogether. Divide your courgette in ¼ – ¾ more or less. The ¼ bit you can slice very thinly with a mandoline. Set aside. The other bit, cut into nice slices (that you will put in a griddle pan afterwards) and set aside. Cut the broccoli into florets (not too large) and add broccoli and sugarsnap to a steamer pan. You can also use a pan with boiling water. I steamed them for a short period of time (about 2 to 3 minutes), as we like them very very crunchy. If you prefer a little less crunch, just leave them in a bit longer. Heat the griddle pan, add some olive oil (I know, you shouldn’t, so if you are very meticulous about this, just rub your courgette with some olive oil ;0)) and crank up the heat. Once very hot, lower to medium heat and add the courgette. Just leave and turn, they sould look nice and bbq’d, then they’re perfect. Cut the red chili (I do deseed them, otherwise it’s a bit too spicy), chop up a handful of fresh mint and once all the veg is done, you can start assembling your dish. To finish off, add a lug of olive, the zest and juice of half a lemon (mine wasn’t very big. 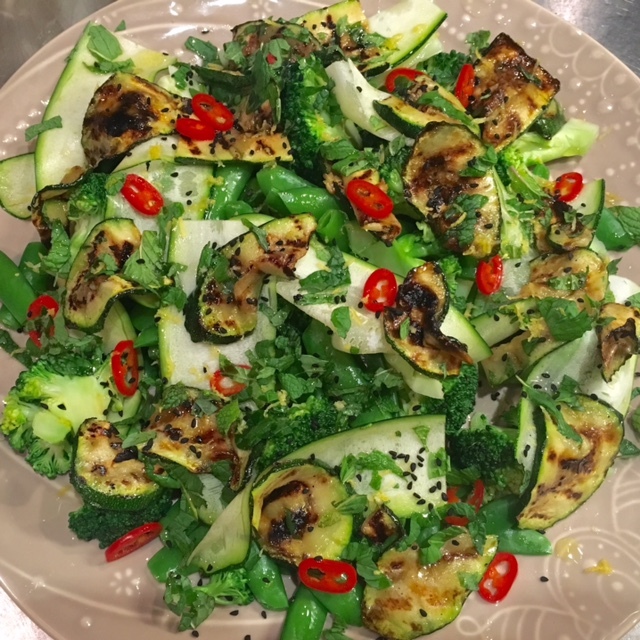 If yours is, it may be better not to use it all and to taste to see if you would like to add a bit more), sea salt, black pepper, the fresh mint and the most important ingredient, the hero of this dish, the nigella seeds! Please do try to get your hand on these, as they are more or less what make this salad so special. If you’re in Amsterdam, you can buy them at Sener (I mentioned this place in my stuffed sweet potato recipe), at the Ten Kate market, at the Albert Cuyp market, at any Iranian/Moroccan etc “supermarket” and probably at Marqt as well. Long story, but it’s so so easy and quick and absolutely delish! It would help if you use a really nice extra virgin olive oil and a nice flavoursome lemon. I just had leftovers for lunch (2 days later) and it was still absolutely yummy!